Well here we are another beautiful day hope this keeps up for the weekend as we are having a family party for Abbie, on Wednesday, her birthday, we went to the beach at Lytham, she asked us for a metal detector for her present so off we went metal detecting, unfortunately we didn't find any treasure, but we had a lovely day the sun shone all day and we had a good time on the beach. For my card I have once again used a print of one of my husband's paintings as most of his paintings are Nautical, this one is called Suffolk Coast. How lovely to be able to make such unique cards with your husband's paintings.The papers, embellishments and design show it off a treat. Sounds like a great day out Wednesday, the sunshine have even made it to our neck of the woods today. Another gorgeous card, especially for those difficult ones we have to make, namely the guys. What a wonderful day you all had at the beach.Hope Abbie has more luck looking for treasure next time. Hope the party goes well too and the weather stays fine for you all ! 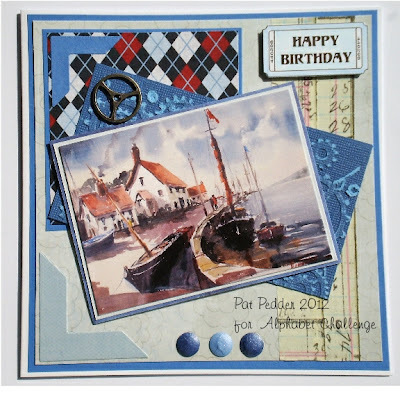 Beautiful card Pat ! l am a fan of your hubbie's artwork.He is very talented.You have shown this print off to its best..lovely work ! Pat, this is gorgeous. So glad you are having wonderful weather. Alan's painting is so beautiful, lucky you with all this gorgeous artwork. I have a little something for you on my blog when you have time. Your hubby's image is just amazing - he's a clever man isn't he! Fabulous card - love the colours. Glad you had a good day metal detecting. Thank you so much for dropping by and leaving me some lovely comments, they are very much appreciated. thanks for joining us this week at party time tuesdays!! i hope you'll come back soon! You sure have been busy Pat --- really nice card. Trying to do some catching up.